Every season Chilliwack River Rafting provides action packed and affordable outdoor adventure for groups from across Vancouver, the Lower Mainland and around the world. We offer the most outstanding group rates in British Columbia! 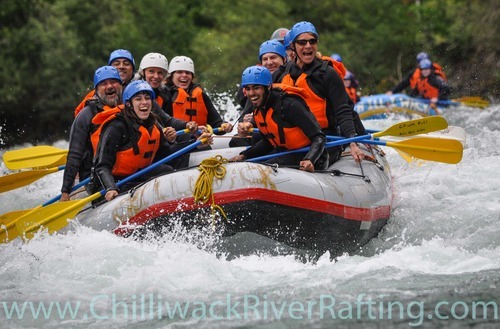 With our riverside base, transport options, and experienced staff, Chilliwack River Rafting has the flexibility needed to tailor the day's adventure to suit your group's specific needs. Groups from Vancouver, Washington State, Vancouver Island and across BC return to our property to enjoy their yearly rafting party. Why not start a tradition with your friends? It's an annual adventure that no one will want to miss! What better way to celebrate upcoming nuptials than ramping it up on the river, and then relaxing around a campfire amidst the mountains at our private resort. This is a treasured pre marriage rite for many peer groups who come back every time a friend gets married for more fun and advice. Wake the next morning to breakfast and leave with a year's worth of stories. 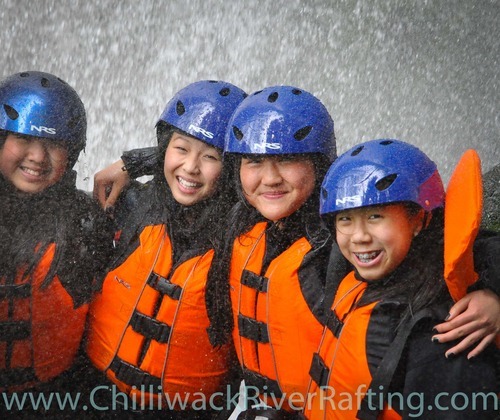 Chilliwack River Rafting is the choice of hundreds of Vancouver and Fraser Valley B.C. companies looking for a staff reward or team building exercise. 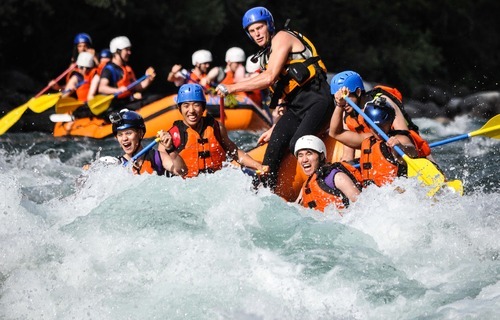 Once you've learned to paddle white water together, it makes daily workplace challenges easy! Our goal is to build strength and unity in your organization, and put a buzz in your office that will last all year. College and Career, Youth groups, Young Marrieds, and whole Church Families choose us as their base for a retreat like no other. We reserve a private camping area for our friends of faith to live out their beliefs while on our property. 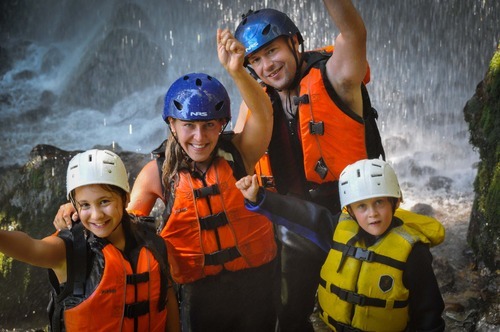 Hundreds of families who want to bond through shared adventure. 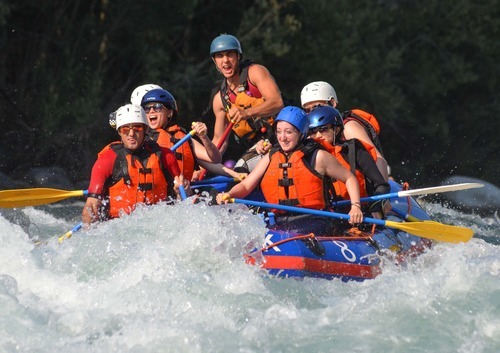 Visiting relatives, birthdays, and graduations are all great reasons to go rafting. Chilliwack River Rafting is fun and closer than you think! We have trips for both timid first time rafters and fearless teenagers. Call us to find out which trip is best for your family. All rafters must weigh a minimum of 22kg. Each season we host groups as small as 10 and as many as 200 to enjoy a wide variety of activity days tailored for our youthful adventurers. Our staff is trained and experienced in delivering risk-reduced, organized, and exhilarating experiences for the children in your care. 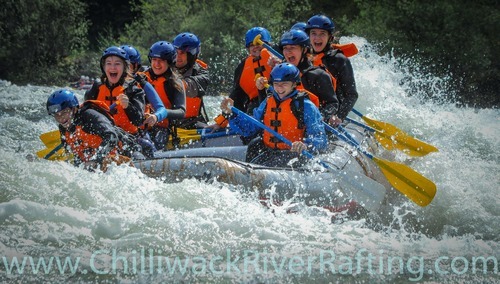 Our experience and knowledge of the river allow us to individualize your group's trip to ensure that the level of risk and adventure is appropriate to your group's age and ability. Many of our client groups add a half day of guided caving in the Chipmunk Caves or a guided hike to Lindeman Lake or Elk Mountain to ensure a full day's worth of active adventure. Our operations base is the perfect place for your Grade-wide camping trip, Night to Remember, Dry-Grad, or staff Professional Development function.